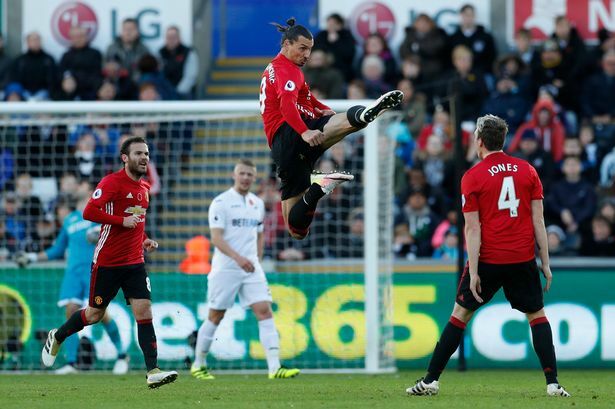 Zlatan Ibrahimovic joked about his one match suspension after Manchester United’s 3-1 win over Swansea at the Liberty Stadium on Sunday, questioning why he was even booked. Ibrahimovic received his fifth yellow card of the season in south Wales, ruling him out for United’s next game against rivals Arsenal after the international break. “I thought we played rough in England? I play rough and I got a yellow card. What was it for? I don’t know. Maybe I was too tired to hear why the referee gave it,” said the 35-year-old. The Swede also said he was never concerned at his goal drought, and insisted that the goals will keep coming should United carry on creating chances. “No [I was not worried about the drought], as long as you create the chances which I have been doing the goals will come. But the most important thing is the win. The goals will come,” he told reporters. Ibrahimovic also set a milestone against the Swans, scoring the 25,000th Premier League goal. “I wasn’t [aware that it was the 25,000th goal]. I thought that was only me who had scored 25,000,” he added. Not only this, but Zlatan scored his 400th club career goal with his second of the game. Not a bad afternoon for a man who has been under serious pressure of late.